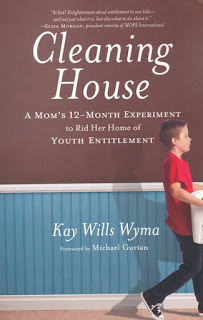 Cleaning House: A Mom’s 12-Month Experiment to Rid Her Home of Youth Entitlement by Kay Wills Wyma is one of the most practical parenting books I’ve read in a long time. Perhaps this book struck such a chord with me because I often find myself doing things for my children that they could handle themselves. The author reminds me how much better it is to allow them to see what they can accomplish when given age-appropriate tasks. Kay Wills Wyma realized how self-centered her children had become and decided to start a year-long project of teaching them personal responsibility and increasing their independence. She realized how much she did for them, even simple things like ordering their meals at a restaurant. She challenged herself and her children by forcing them to tackle new tasks. The author gives readers a month-by-month accounting of the projects they undertook. She includes specific examples and shares their failures as well as what worked out well. One of my favorite chapters was Kitchen Patrol, in which she teaches her kids to plan, shop for, and cook a meal from start to finish. Another, Runner’s World, has them doing errands on their own, such as picking up clothes at the dry cleaners and going into the grocery store alone to purchase an item. (In both cases, she waited in the car). I’ve heard the saying that you should never do for your children what they can do for themselves. Though it’s often easier and faster for us as moms to do things ourselves, this book definitely challenged me to encourage my children’s independence. As in Wyma’ case, whining and complaining may be our children’s reaction at first, but I know that in the long run, they – and I – will benefit as they learn to become more self-sufficient. I thoroughly enjoyed and highly recommend this book. I may have to get a copy of this book; I definitely do too much for my children. Thanks for the review!